Ovro is half of Hæretici 7o74. Hæretici 7o74 is a duo of Ovro and Niko Skorpio. Joining forces, the artists bring together the more meditative and ritualistic elements of their solo works, blending it to something completely new. Recognizable, but distinct. Hæretici 7o74 concentrates on live performances, enjoying the organic and interactive feel of playing live, with its often surprising turns and twists. 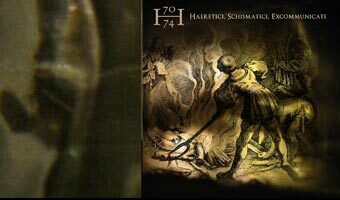 Haeretici, Schismatici, Excommunicati is the band's first release, and contains the recording of the group's live performance at club Syntesia in Tampere, Finland in January 2006. Here, deep dark ambient soundscapes meet creeping rhythms and ecstatic oriental vibes. This is musical heresy, where the alchemical potential of not playing by the rules or expectations comes abloom. Purists, clinging on to their cherished dogmas in the dust of their crumbling temples, will be itching to burn these heretics alive.